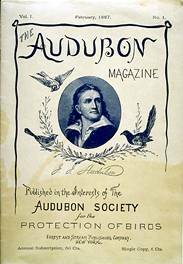 The Audubon Magazine. Facsimile published by the National Audubon Society as a supplement to the March 1987 issue of Audubon. Originally published by Forest and Stream Publishing Company, New York, February 1887.
ational bird conservation sentiment, closely associated with scientific collectors, found a voice in The Audubon Magazine, published between 1886 and 1889. George Bird Grinnell, publisher of Forest and Stream, in association with the American Ornithological Union, published the magazine. This first national Audubon organization claimed 200,000 members, but lack of financial backing and issues such as new laws that prevented collecting caused the organization and the new bird conservation movement to flounder. Sanctuary, The Journal of the Massachusetts Audubon Society. Massachusetts Audubon Society, Lincoln, Massachusetts, January/February 1996. Five O'Clock Tea, by Charles Baude, after original by Edouard Gelhay. From Harper's Bazar, Saturday, February 15, 1893. Courtesy Smithsonian Institution Libraries. oston socialites Harriet Lawrence Hemenway and her cousin Minna B. Hall founded the Massachusetts Audubon Society, the longest-lived organization dedicated to bird conservation and public education. After reading about egret hunting practices in 1896, the two women were determined to persuade and convince other prominent women that they were committing a deadly and tragic wrong by wearing birds or bird feathers on their hats. Through a boycott and tea parties, they convinced some 900 women not to wear feathered hats, and to work with their new group to promote bird protection. They also encouraged the use of ribbons and other millinery decorations in place of feathers. Mrs. Florence Merriam Bailey, bottom right, with other officers of the Audubon Society of the District of Columbia. Washington Life, 1905. Courtesy Smithsonian Institution Archives. ithin six years of the Massachusetts Audubon Society's founding, 26 other states had formed their own Audubon societies. The Audubon Society of the District of Columbia (now the Audubon Naturalist Society) was founded in 1897 by, among others, Florence Merriam Bailey. She was the sister of C. Hart Merriam, the first director of the Department of Agriculture's U.S. Bureau of Biological Survey, the organization responsible for legislation in favor of birds and the confiscation of birds illegally hunted and transported. Florence Merriam Bailey became one of the bird class instructors at the District of Columbia's Audubon Society. 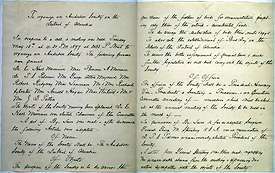 "To Organize an Audubon Society in the District of Columbia," notes for Founding Meeting, May 18, 1897, Audubon Society of the District of Columbia. Courtesy Smithsonian Institution Archives. By-Laws (left) and officers (right), Audubon Society of the District of Columbia, 1897. Courtesy Smithsonian Institution Archives. 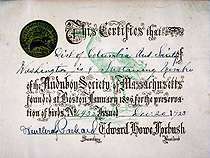 Certificate of membership, Audubon Society of Massachusetts. Courtesy Smithsonian Institution Archives. The Normal School Bird Class, about 1900, Audubon Society of the District of Columbia. Photograph by the B. F. Johnson Publishing Company, Richmond, Virginia. Naturalist excursion, about 1918, Audubon Society of the District of Columbia. Courtesy Smithsonian Institution Archives. Binocular, circa 1900-1920. Bausch & Lomb Optical Company, Rochester, New York. Patented June 22, 1897, by Ernst Abbe of the Carl Zeiss firm, Jena, Germany. ird watching and the study of birds became popular pastimes around the turn of the century. At the same time, legislation was just beginning to slow the trade in feathers. The Audubon societies were a natural source for related educational material and instruction. The District of Columbia's Audubon Society began its bird classes in 1898. The early classes, for teachers, covered such subjects as birds in life and in literature and classification, migration, distribution, and identification of birds. The society gradually extended its instruction programs to the general public. Both the Massachusetts Audubon Society and the Audubon Naturalist Society continue to be active in conservation and environmental education. The National Audubon Society-until 1940, the National Association of Audubon Societies for the Protection of Wild Birds and Animals- was incorporated in 1905. Formed with the cooperation of some of the early Audubon societies, it worked for legislation and education to protect birds and other animals on a national level. 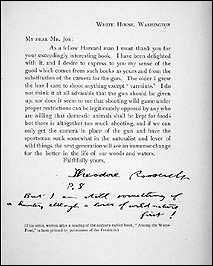 Letter from Theodore Roosevelt to Herbert K. Job, about 1903, from Job's book, Wild Wings, Adventures of a Camera-Hunter among the Larger Wild Birds of North America on Sea and Land, Houghton Mifflin & Company, Boston, 1905.
heodore Roosevelt (1858-1919), well known for his interests in wildlife conservation and sport hunting, established the first national bird reservation, now Pelican Island National Wildlife Refuge. He created 50 additional reservations for birds and other animals by the end of his presidency in 1909. "President Roosevelt's List of Birds," 1908, from Birds of Washington and Vicinity, by Mrs. L. W. Maynard, Washington, D.C. Published by The Lord Baltimore Press, the Friedenwald Company, Baltimore, Maryland, copyright 1898. Bald eagle feathers. Courtesy National Zoological Park, Smithsonian Institution. any birds were lost to extinction by the turn of the century: the Eskimo curlew, great auk, Labrador duck, passenger pigeon, Carolina parakeet, and heath hen. And other birds and animals suffered heavy damage that still requires careful management. 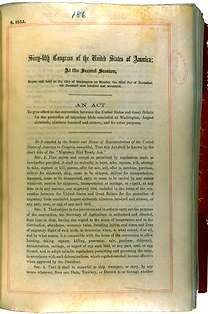 The Lacey Act of 1900 and subsequent laws became important animal conservation landmarks. Today the hunting, transporting, selling, and possession of any animal species, or their parts or products, considered to be endangered, threatened, or migratory-except for allowed game animals-is illegal. State and federal agents continue to confiscate illegal shipments of animals and animal parts or products. Between 1993 and 1998, the U.S. Fish and Wildlife Service seized some 27,000 illegal shipments of birds. Permits are issued for certain exceptions, as for the ceremonial or religious use of eagle feathers by American Indians. Skin of Pacific loon. Confiscated by the U.S. Bureau of Biological Survey, Department of Agriculture, 1920. 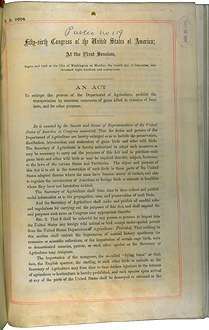 Lacey Act, enacted December 4, 1899, by the 56th U.S. Congress. Reproduction courtesy the National Archives. 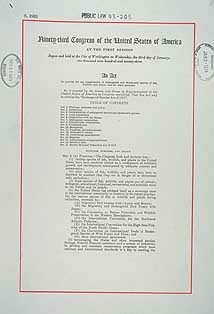 Migratory Bird Treaty Act, enacted December 3, 1917, by the 65th U.S. Congress. Reproduction courtesy the National Archives. 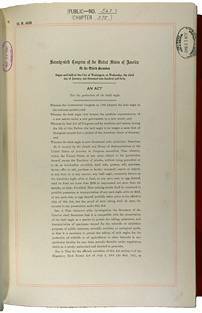 Bald Eagle Protection Act, enacted January 3, 1940, by the 76th U.S. Congress. Reproduction courtesy the National Archives. Endangered Species Act, enacted January 3, 1973, by the 93rd U.S. Congress. Reproduction courtesy the National Archives.